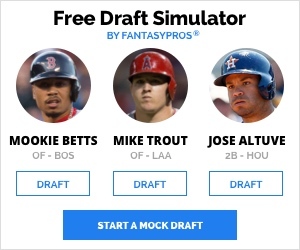 Over the next 45 days the staff here at The Fix will profile and predict the fantasy fates of prospects that could – should, in some cases – be closely monitored on the waiver wire or even in the draft room. For the projection portion of the article, we will try our best to give you projections from all three major projection systems. Those projection systems are: ZiPS, Steamer, and Oliver. Oliver varies from the other two by projecting what a player would accomplish over 600 PA. Obviously, most prospects won’t reach 600 PA, due to various reasons. It can help to pay more attention to the rate stats that are included in order to get a clearer idea of what you’re dealing with in a particular player. In 2011, the Houston Astros acquired Jonathan Singleton and others from the Philadelphia Phillies in exchange for Hunter Pence. The lefty slugger mashed the baseball in 2012 for the Astros’ Double-A affiliate and was labeled as one of the best first base prospects in the game. His strikeout percentage crept up to the low 20’s, but Singleton paired that with plenty of power and an above average walk rate. Last year, Singleton’s season was delayed due to a drug violation (marijuana). He was suspended 50 games. Upon his return, he made short stops in Single-A and Double-A, before settling in at Triple-A. Singleton’s misfortunes continued as he struggled mightily at the plate. Known for his plus power, Singleton came up short in that area during his time at Triple-A, posting a career low ISO. What was even more discouraging was the strikeout rate, which ballooned to over 30%. There were some encouraging signs, however. After a rough season in the minors, Singleton dominated Puerto Rican Winter Ball. 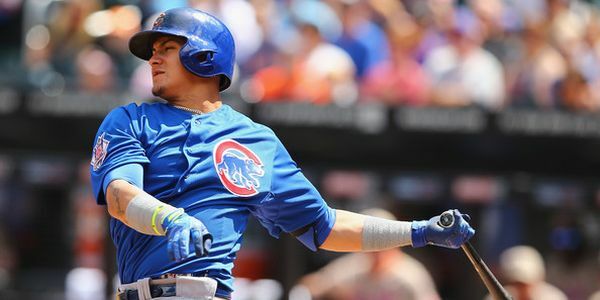 He led the league in home runs, total bases, and OPS. More importantly, it sounds as if he is getting his off-the-field life back together, opening up about his drug addiction and dealing with it in a positive way. 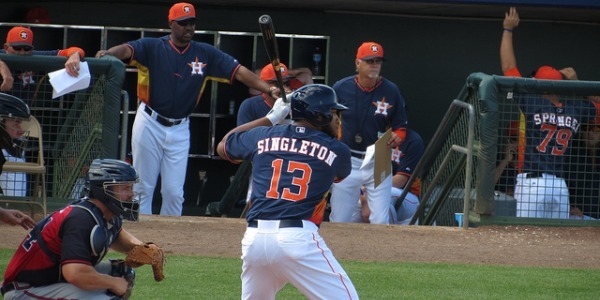 After a disastrous and uncharacteristic year at the plate, Singleton is looking to bounce back and take over the Astros first base job as soon as possible. 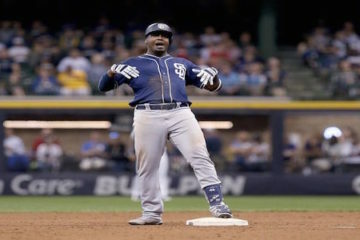 The players that stand in his way are unspectacular to say the least, so his big league call up is only a matter of time. Many prospects generate plenty of buzz this time of year, but Singleton could be one of the few to get an early call and impact the majority of the season. Singleton’s latest comments about his life are encouraging. Whether you consider marijuana a big deal or not, Singleton’s mentality appeared to not have been in the right place to be a successful major league baseball player. The winter league results and the spring reports about his conditioning are positive. It remains to be seen if Singleton can continue to do what he needs to do to be a success on the field. 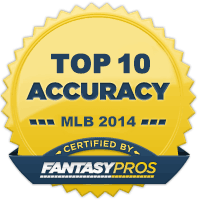 Even a pretty decent BABIP couldn’t save Singleton’s 2013 season. If he wants to have a chance for success at the big league level, that K% is going to have to revert to what it was in earlier seasons. And even then, it isn’t all that great. Let’s see how real his struggles are versus lefties. Yeah, they are real. It isn’t that Singleton just strikes out more versus lefties, much of his power seems to be missing as well. You can’t help but see a future platoon candidate. Considering where the Astros are as a team and who Singleton is as a hitter, a mix between ZiPS and Steamer seems to be the best bet for what the first baseman could produce in 2014. The 24 home runs by Oliver are nice (and unlikely), but the rest of the projection is very harsh. It would be surprising to see Singleton struggle that much at the major league level. 38.3% strikeout rate? Oof. That would have led all hitters with at least 150 plate appearances last season. Jon Singleton can hit the ball far, but his impact on the 2014 season looks a bit cloudy. He can’t hit lefties and there is a cool breeze from all the whiffs. Once he gets the call, Singleton could be useful as a strict platoon bat in deep leagues (15+), especially ones that count OBP. Assuming he gets the K’s to a salvageable place (22%-27%), a .250-.270 hitter with 25-30 home run power is possible, even if he continues to struggle against left-handed pitchers. But taking into account playing time and his past production, there just isn’t a reason to expect that kind of success from Singleton in 2014. Follow Rich on twitter @Rich_Migs and chat sports, music, poker, or anything else that's remotely interesting. Feel free to ask him fantasy sports questions too.